Insight Report Miriam Mazer provides the low-down on India’s nuclear parks at Mithi Virdi, Gorakhpur, Kovvada, Jaitapur and Kudankulam—as well as Rajasthan, Kakrapur and Chutaka, three sites that will deploy the country’s indigenous PHWR technology. Kovvada is being fast-tracked by Andhra Pradesh state, but ongoing protests and steep budget cuts could take a toll. India’s big plans for expanding its nuclear fleet are making waves in the global nuclear-energy community. The cornerstone of development consists of five proposed nuclear “parks” to be built at sites in Mithi Virdi, Gorakhpur, Kovvada, Jaitapur and Kudankulam. The government agency responsible for the construction and operation of the nuclear plants, the Nuclear Power Corp. of India Ltd. (NPCIL), has begun preliminary studies at all of these sites except Kudankulam, where one unit is fully built, though not operating (Insight, Feb. 4). NPCIL is also expanding existing power plants in Rajasthan and Kakrapur, and examining the possibility of building a smaller plant in Chutaka. The project at Mithi Virdi in Gujarat took a boost in late January. State-owned Engineers India Ltd. released an environmental impact assessment (EIA) with findings that a six-unit plant there would be “environmentally benign and sustainable,” and would enhance economic and social development in the region. Last June Westinghouse signed a Memorandum of Understanding (MoU) with NPCIL to negotiate an early works agreement for plant construction, which should begin this year. The MoU calls for reactors to go on line at the end of the decade, with units 1 and 2 connecting to the grid in 2019-20, units 3 and 4 in 2021-22, and units 5 and 6 in 2023-24. The EIA covered passive and engineered safety features and the systems for controlling all types of waste. Now NPCIL plans to hold a public hearing about the Mithi Virdi project on March 5. NPCIL has also earmarked the Kovvada plant, in the state of Andhra Pradesh, for development by an American company, with plans to install six second-generation GE Hitachi reactors. GEH signed an MoU with NPCIL in 2009. In December the Department of Atomic Energy accepted a proposal from NPCIL to raise the plant’s capacity from 6,000 to 9,500 MW. Now NPCIL is holding talks with the Ministry of Environment and Forests to get clearance for the larger capacity. The Andhra Pradesh government plans to fast-track the plant. It issued a land order for nearly 2,000 acres on Nov. 1. However, the order requires the eviction of almost 8,000 people. Loss of land and livelihood has been a key motivation behind the anti-nuclear protests raging throughout India. The Indian government’s response usually fails to address these fears. However, recent news brings hope that officials are revising their approach. In Gorakhpur authorities settled their differences with villagers in September 2012 with a large compensation package. Work on the plant began shortly thereafter on Sept. 6, with NPCIL kicking off a topographic survey and soil studies of the site. Gorakhpur will house four indigenous 700 MW PHWRs, for a total capacity of 2,800 MW. Similar good news came out of Kudankulam, famously dogged by protests since 2011. Government officials have proposed $94 million for redevelopment and began discussing the details with local leaders on Feb. 1. Kudankulam officials announced on Feb. 5 that they will heat Unit 1 to its maximum levels for its second test. Unit 1 should begin commercial operation this month. Kudankulam is home to two Rosatom 1,000 MW VVER reactors, and India and Russia are planning to build up to six more reactors at the site. 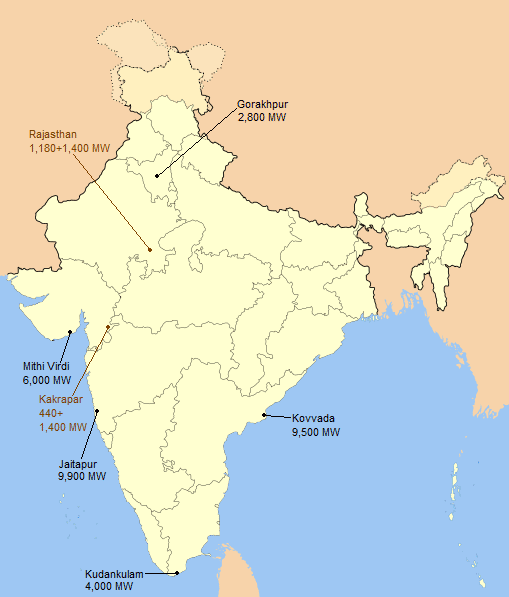 AREVA will construct up to six third-generation 1,650 MW EPR reactors at Jaitapur for a total capacity of 9,900 MW. After receiving approval from the environment ministry the company signed a $9.4 billion framework agreement in December 2010 to build the first two reactors and supply the fuel for the next twenty-five years. However, the project appears to have made little progress. AREVA hoped to sign a contract by the end of 2012 but has yet to make a related announcement. NPCIL is also beefing up its existing plants. It is currently building four more indigenous 700 MW PHWRs—two at Kakrapar and two at Rajasthan. The new Kakrapar units are expected to go on line in 2015, with Rajasthan’s new reactors close behind with commissioning in 2016. The government is also discussing building a new indigenous-technology plant with at least two 700 MW PHWRs in Chutka. Another fearsome obstacle to India’s nuclear roadmap has now arisen: budget cuts. On Jan. 31, Financial Minister P. Chidambaram announced large budget cuts that aimed to achieve a fiscal deficit, and nuclear projects are among the items under the knife. Instead of the expected $1 billion, India’s nuclear budget will only receive $243 million. Which projects will survive remains unknown.